You’ve finally settled on a wedding style and theme, but now here comes the next big step, picking out the perfect wedding gown. As a bride, your wedding dress is put on display for everyone to see and it will live on in your wedding album, so it’s understandable that you want to find “the one.” Your wedding dress should be one that suits you and your personality, and the process should be a memorable and exciting one. Isn’t this the day you’ve been planning in your head since you were a little girl? Don’t let the pressure of finding the perfect dress take away from the excitement and joy of picking out your wedding dress. If you are having trouble picking out the perfect gown, check out these helpful wedding dress tips to help make this stressful process a bit smoother. When you make your wedding dress appointment, don’t schedule it late in the day. Instead, schedule your appointment first thing in the morning. If you can, get the first appointment of the day so you can get the full attention of your wedding dress consultant. If the wedding boutique allows it, bring along your camera when you are shopping for your wedding dress. Don’t just rely on the mirror, take photographs as well, especially if you are concerned how your dress will look on camera. Just make sure to take pictures from all angles. Before you start nitpicking every little detail on the wedding dresses you are trying out, know which silhouette works best for you. This can save you a lot of time and frustration when you know what to look for first before you start going crazy about all the tiny details. Would you rather go alone when you are searching for your perfect dress? If that’s how you feel, go alone! There is nothing wrong with flying solo, despite what the media says. You don’t need to bring an audience with you when you are trying on dresses. Too many options and thoughts can cloud your judgment. Make sure you are wearing well-fitted undergarments when you are trying on your wedding dress. If possible, wear the bra that you plan on wearing on your wedding day. Not only will this help when it comes time to try on your dress, but it will uplift you in between dresses when you are standing around in your skivvies. Don’t automatically pick a dress because it’s trendy, instead choose a timeless dress that suits your style and flatters you. You want a dress that stands the test of time, one that will never go out of style and will always look good every time you look at your wedding album, even years down the road. Don’t be afraid to try on a lot of dresses, and don’t just go by how the dress looks on the hanger. Every wedding dress will take on a different look and shape once someone is wearing it, so don’t judge the dress until you try it on. Even that dress that looks terrible on a hanger can look absolutely stunning once you wear it. Just don’t try on too many dresses. You don’t want to go into information overload. Watch out for impulse shopping and make sure you put a lot of time and consideration into your decisions before you put it on plastic. Remember, most boutiques have a no return policy on wedding dresses and wedding accessories. The last thing you want when you are planning a wedding is wasting your money on impulse purchasing and screwing up your budget. 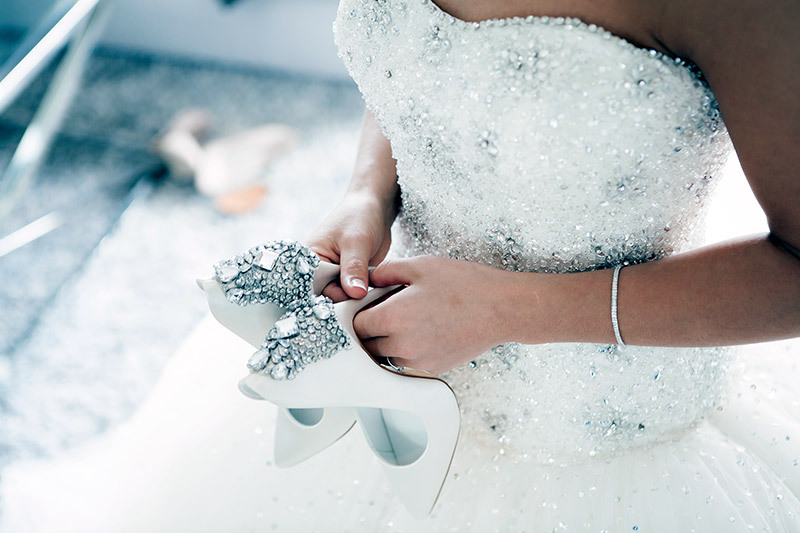 Although shopping for your wedding dress feels a bit like living in a fairy tale world, don’t push off other wedding-related tasks during the process. Choosing the perfect venue for your big day can be just as exciting as finding the perfect wedding dress. If you’re looking to get married in New York City, consider a one-of-a-kind venue like a luxury private yacht. Discover the amazing amenities aboard the Aqua Azul. Book your dream NYC wedding.